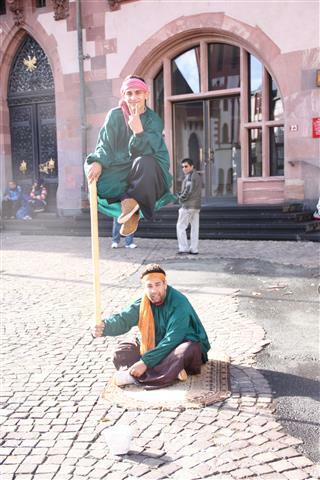 Street magic, street performers and buskers are now a commonplace sight in the centre of many European cities. Most often it’s the scenario of a musician playing drums/ keyboard / guitar / violin / or whatever instrument, with a hat or the musical instrument’s case out the front for the passing public to throw some coins into as a mark of their appreciation. The quality of the music produced usually ranges from one end of the musical scale to the other, with some musicians able to stop you in your tracks and bewitch you with their talent, they amaze you with music or voice that is better deserving of a world stage rather than any ordinary street corner, but on the other extreme I’ve also seen some small children slowly scratch out musical scales or a simple piece and it sounded like a slow motion musical murder. Small children I applaud and donate, no matter how bad because I deeply admire their courage to stand up and preform in public, especially when adults walk past ignoring them, that takes a special kind of fortitude. I have however seen a disappointing trend where some adults, in a particularly wretched state of dress and disposition stand and hum, or make a few incoherent notes that in no way resembles “music” and then shake a hat under your nose and expect payment. These “buskers” always look particularly dishevelled and desperate and I’m under no illusions that any cash gained ends up fuelling an addiction of one sort or another. There has also been a rise in performers who coat themselves in gold or silver (grey?) face paint, don a matching gold or silver (grey?) outfit and pretend to be statues by standing as still as possible. Sudden moves on occasion scares one member of the public and entertains others and thus the coins roll into the hat. And then there are the “illusionists”… they never, never ever let the public see them set up their gig, there is always a large screen of cloth handy to hide the “tools of the trade” and once the drapery is removed the “illusion” is revealed. This one involves one man seated on the ground upon a “magic carpet” which usually has a metal “base” hidden below it. The man seated on the ground is the “counterweight” for the gent sitting above him. There is a hidden metal pole that runs along the seated man’s arm, then the gent at the top sits on a hidden seat, hidden of course under his conveniently baggy clothes. Our kids, unaware of course of the simple trickery, are suitably impressed and looking at their innocent faces you can almost see their brains ticking over trying to work out how on earth what they are seeing is possible. Since taking a photograph more or less necessitates making a donation, I give a kids a coin each to put into the small bucket close by. Long afterwards when sorting the photographs the thought struck me that without an additional accomplice at hand, in theory anyone could steal the bucket and run off with it because the seated gentleman can’t get up quickly to give chase without toppling the friend above , and the gent above can’t get out of his contraption of hidden metal and long robes very quickly to spring off and give chase. 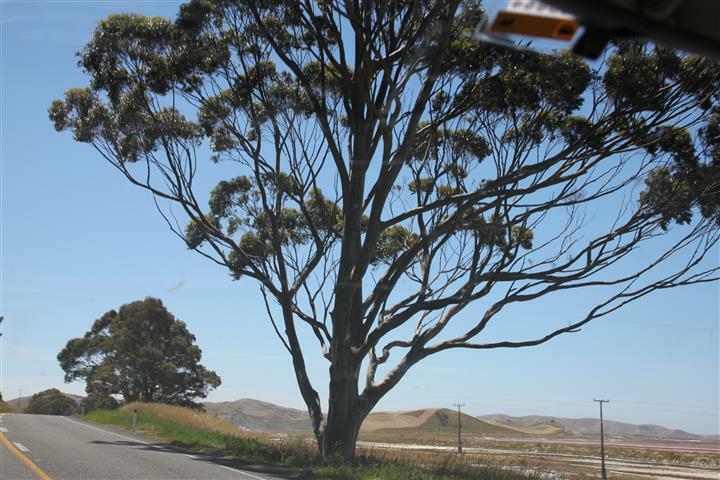 Luckily Family Kiwidutch are honest souls and would never contemplate stealing from anyone. 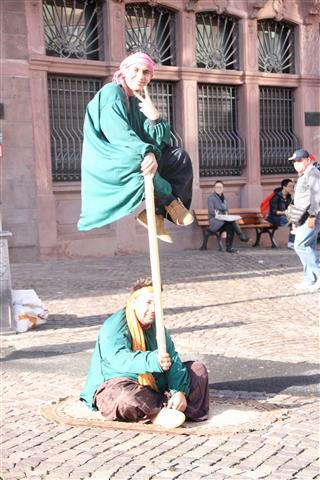 I have no idea roughly how much these street illusionists might earn, I suppose it depends on the season, which street corner they are on, the time of day, the weather and many other variables. They give the illusion of being real magic and for some folks like my children, that’s the most magical thing of all. 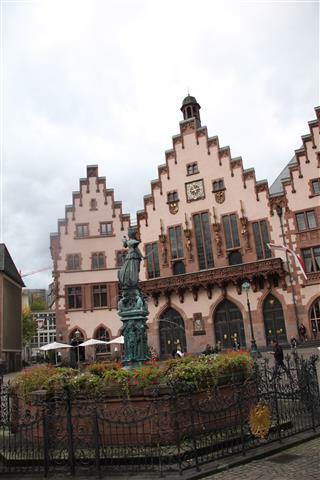 This is Frankfurt’s oldest fountain , and it is adorned with a statue of the goddess Justitia (Justice) with unbound eyes, a scale and sword. 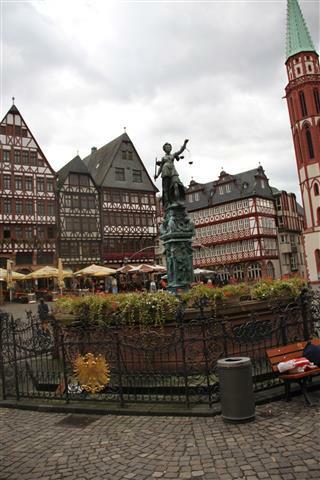 The first Fountain of Justice in front of the Römer was inaugurated in 1543 as a monument to the city’s self-image. 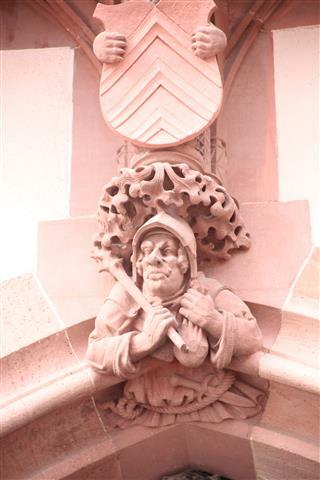 In 1611, the sculptor Johann Hocheisen created the current eight-cornered fountain and the figure from red sandstone. 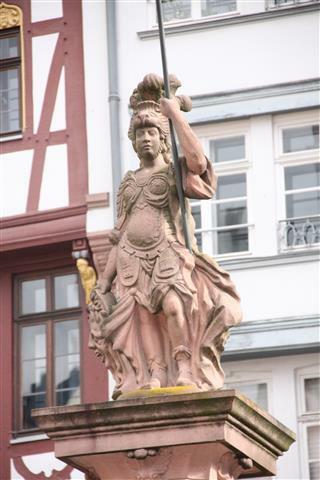 Since the coronation of Emperor Matthias in 1612, water has flowed from the breasts of 4 water nymphs on the corners of the statue’s pedestal as a symbol of fertility. 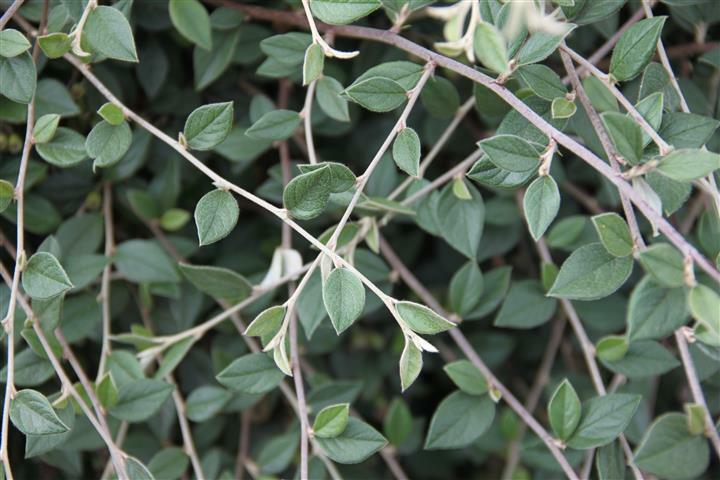 At the coronation celebration, wine flowed from the fountain, and residents of the city crowded around it so boisterously in their enthusiasm that a first reconstruction was required immediately. 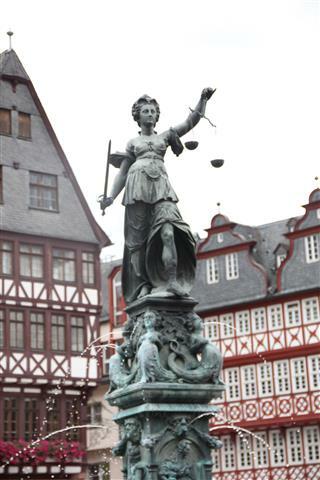 The current Justitia, made of bronze, was funded by a Frankfurt wine merchant. 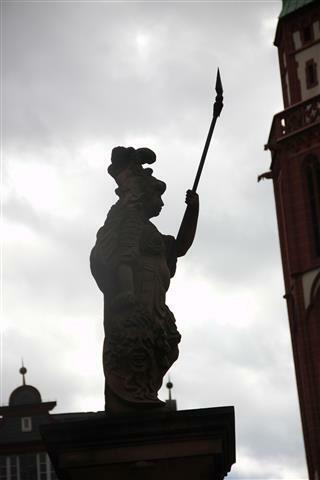 Her eyes are not bound, and she holds up scales and a sword and is a popular meeting point in the city. Further down the square stands another statue high up on a column, another female that stands in a slightly similar pose to Justice, with flowing robes, protruding belly (or is that armour) but this woman holds a spear (or a lance) instead of scales. It’s rather unfortunate that since most of my photographs have been taken look directly into the sun, that the silhouette form of this second statue takes on more of the form of “Punch” from the English “Punch and Judy”. I didn’t find out who or what this one represented, but the style is of a rather similar to that of the “Justice” statue nearby. 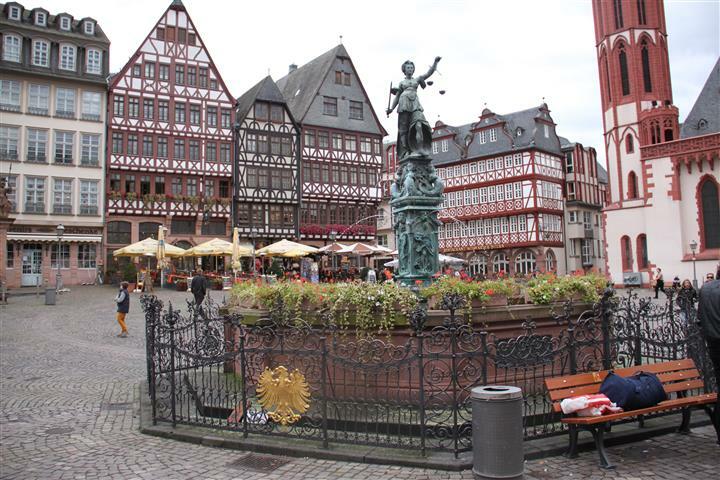 This archive post finds us in the Römerberg, the historic centre of Frankfurt, and having taken a look at the beautiful buildings around us, my attention is now dawn to an ornate statue and fountain close by. 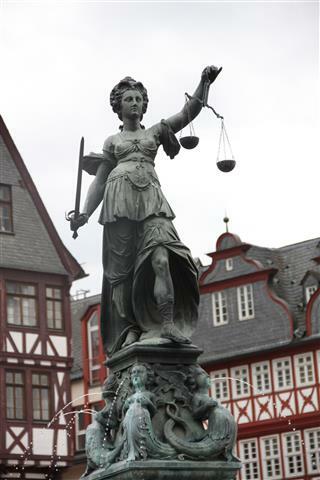 It’s called “Gerechtigkeitsbrunnen” (Fountain of Justice) and before I get to know more about it, I am distracted by an observation close by. It was difficult to get photographs of the fountain because a family appeared to have installed themselves on the only seat, which happened to be the best direction to get photographs (the other side looked directly into the sun) . At first I assumed they must be waiting for someone but closer observation (without being obvious that I was looking of course) revealed that the family had three children with them and at one end of the bench seat there were a few shopping bags and a sports bag, but at the other end a small mountain of possessions, mostly in large cheap plastic striped shopping bags. They certainly looked more like they were homeless than tourists on the move. I move slowly on crutches, so we were in the square for a while: they were there when we arrived and still there when we left so I was left wondering if they did have somewhere to sleep that night. Poverty and homelessness is of course a big problem in every big city around the world, the language that they called out to their children in wasn’t German but appeared to be one of the old eastern block languages … my first instincts were for guessing Romanian / Bulgarian / Hungarian since there has been a recent surge in number of immigrants coming to wealthier European countries in the west. I’m assuming that they are economic migrants (because 99 % of them are) and this a decisive issue in Europe at the moment. On one side of the coin, who can blame someone living on the breadline for wanting a better life? From experience they are often less educated people who have been backed into a corner by the cost of corruption and decisions made by leaders who have lined their own pockets and lost contact with the cost of living and the wages of the majority of the population. People in poverty look for light at the end of the tunnel and think that the West holds the answer to their prayers and dreams. Often they are conned by shady “travel guides” (who are borderline people traffickers) who charge families their life savings and/or huge loans to come to the west on the promise that jobs are plentiful, work is easy, the sun always shines, wages are enormous, they will be rich beyond their wildest dreams compared to where they live now, all houses are mansions etc. Naturally with the promise of this utopian paradise, they hand over their life savings as the “deposit” and sign up to contracts that require them to pay back an evil amount of money in as the “remainder of the loan”and “interest” which will then take years or decades to pay back. They arrive to the stark reality that they are not wanted in their new countries of hope, jobs, houses, education, health care are all difficult issues, skills they may have are not of a standard that are readily transferable, and that for the unskilled, the only jobs on offer are by unscrupulous employers who take advantage of their position and want long hours of work for below the minimum wage. The alternative to sleeping on the streets is often to share a single family sized accommodation with one other or more families, often being charged a disproportionately high amount of “rent” for the space and utilities used. 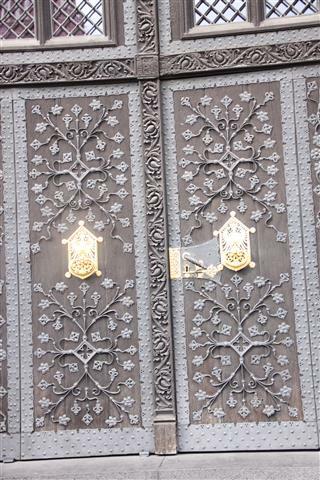 All they want is a better life than the scrapings at the bottom of the barrel that were on offer at home, to give their children hope for a better future and to be free from the corrupt societies that reward and favour those who cream off the wealth instead of distributing it fairly. 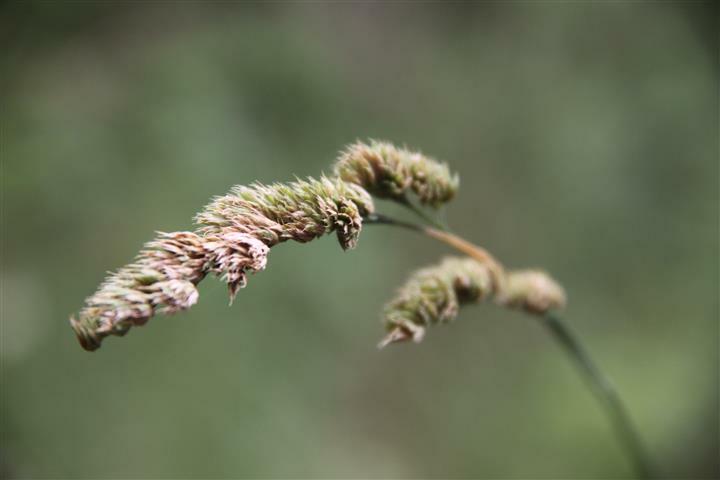 If you were them, and without knowing anything about the reality of what you would be going to, you were promised a better life would you not also think it might be a good chance to improve your lot? On the other side of the coin, reality is that not all people in richer western European countries are rich. We contribute to the gross national product of our countries though our work, but also have to contend with rent, mortgages, study fees, the cost of living and we pay tax. From these taxes we expect a decent eduction for our children, hospital care when we need it, social housing for those on the lowest incomes, care for the disabled, and secure help for the frail and the elderly once they can no longer manage in their own homes. I personally, here in the Netherlands can get a same day or within two days appointment with my GP, and in an emergency as a regular COPD patient can get the same from my hospital lung specialist, so I was shocked to hear that in the United Kingdom it can now be normal to take two weeks to get an appointment with your family doctor and many people can’t find a new dentist willing to take them as patients when they move house as the dental practice already as long waiting lists. Often it’s not immigrants per see that locals object to but rather the high volume of them who have arrived in a very short space of time. Locals cite instances of friends and family who work full time in low wage jobs, who have been years on waiting lists for cheaper social housing, who then look on in dismay as social housing is allocated to immigrant families who can’t speak the local language, often are not in work because they are forbidden to do so whilst their asylum applications are processed and who they see as being “rewarded” in spite of not having “contributed” to society. Long gone are the days when getting a job was easy: the world wide economic crisis has bought budget cuts, reduction of hours, redundancies and a lot of uncertainty in the job market. 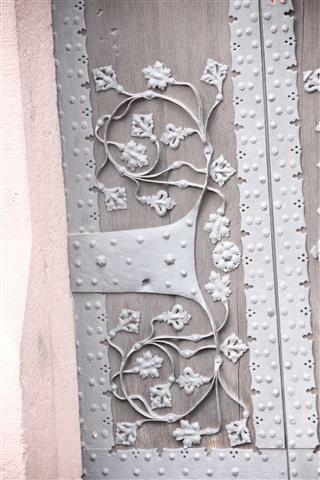 Belts have been tightened a notch, then another and another. Come companies stay alive from one order to another and owners live in fear that they will have to deliver bad news to employees if the next order doesn’t eventuate.Almost every week newspaper headlines tells us of another household-name company in trouble and staff cuts. The populations of richer countries rightly argue that they do not owe anything to people who are mostly economic migrants who did not relocate for reasons of life and death, and made decisions that they now expect others to pick up the tab for. They argue that there are not unlimited resources and that we can not accommodate everyone who wishes for a better life, that a countries own nationals need to come first. There are two sides of this coin and I can empathise with both to a large degree. For me it is a difficult topic, I’m not pro unlimited immigration but I’m definitely not anti-immigration either. Finding a fair and wise balance between the two is a minefield that I’m glad that someone other than me gets to take responsibility for. 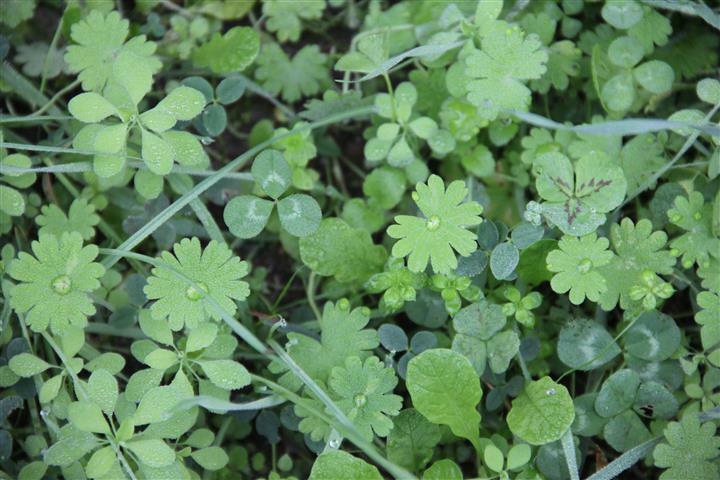 For each side of the coin there are deeply personal stories that pull opinion one way or the other. Somehow something needs to be done in countries where corruption is endemic, corruption, paybacks and nepotism are rife. In an ideal world entire systems need to change but I fear that unless someone of great stature and character rises up in these countries, someone who is prepared to challenge and turn the “old regime” on it’s head, then things will never change. I worry that without the backing of the groundswell of public opinion, such a leader would face at the very least an uphill struggle and at worst sacrifice their own personal safety in their attempt to thwart the corrupt. Until the day comes when all nations are financially equal, there will continue to be a human tide of migrants, dreaming of a better life, facing the harsh reality, sitting on a bench seat in a touristic city centre with all of their worldly goods in shabby cheap striped shopping bags, trying to navigate life in the shadow of The Fountain of Justice. 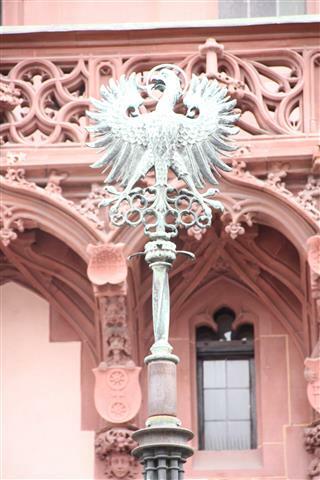 I’m continuing yesterday’s post, where we were visiting the Römer, in the historic heart of Frankfurt. 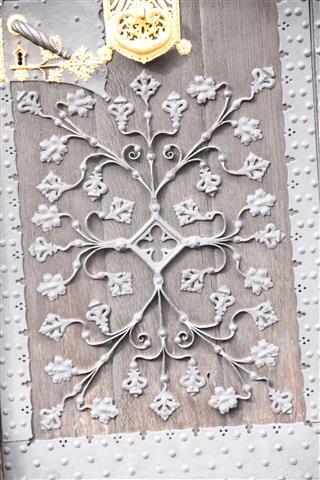 I’m intrigued by the history of it all, and if you are a regular reader you will be more than familiar with my fascination for detail of any kind. In this instance the architectural detail on display has turned me all dreamy eyed, and in my further reading on Wikipedia I’m equally fascinated by it’s whereby more and more buildings were added to the complex, and interconnected like a rabbit warren. 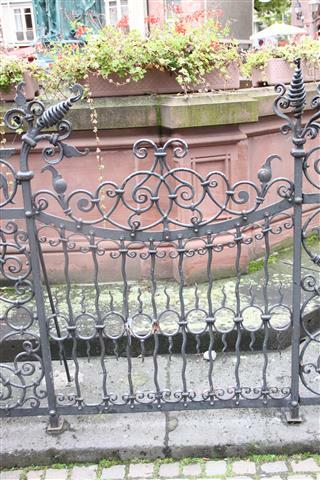 “In 1843, the Frauenstein house and the Salzhaus were added. Finally, in 1878 the city bought the Alt-Limpurg house to the right of theHaus Römer for 214,000 marks. 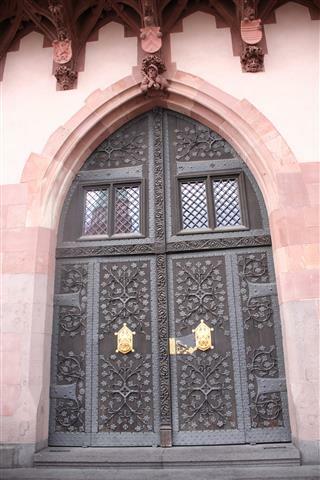 The current neogothic front with a balcony was built from 1896 to 1900. It was initially planned to be much more imposing, but mayor Franz Adickes decided against Kaiser Wilhelm’s suggestion and had the front designed in a more welcoming manner. At the same time, the houses Frauenrode and Viole were demolished to make way for streets through the city centre. They were replaced by a newly erected building to the east. This new building is divided into two wings by the Braubachstrasse. These two wings (the north wing and south wing) are connected by a bridge. 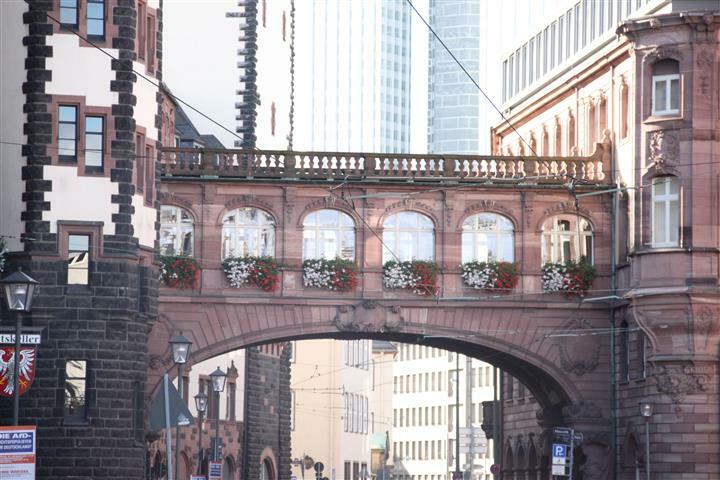 The Frankfurt citizens, who paid their taxes in the north wing, named the covered bridge the Seufzerbrücke (the “Bridge of Sighs”) in reference to the other Bridge of Sighs in Venice. It’s now that the penny drops… I used photographs of the “Bridge of Sighs” in a blog post a few days ago without being aware that it was connected to the Römer, and indeed since it’s some distance away from the other buildings it shows just how far the “rabbit warren” of buildings extends. 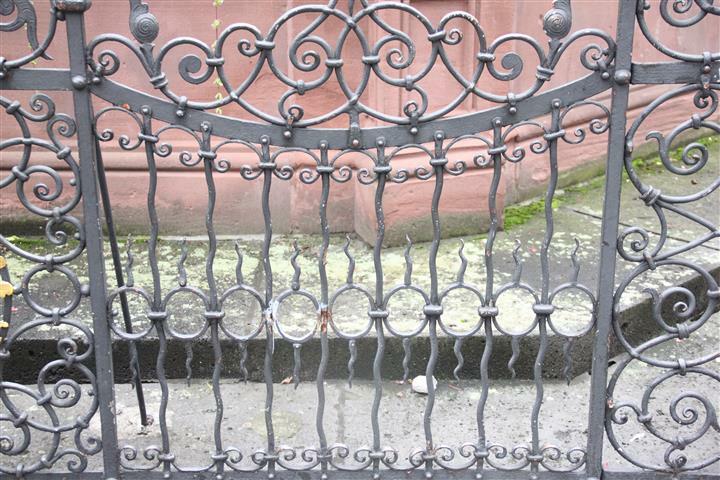 “On the night of March 22, 1944, the Römer, along with the rest of the centre of Frankfurt, was largely destroyed in one of the heaviest Allied bombing attacks of the Second World War. Rebuilt after the war, the Alt-Limpurg, the Römer, and the Löwenstein houses, whose roof structure had in part withstood the attack, were restored in a simplified form as were the completely destroyed houses Frauenstein and Salzhaus. 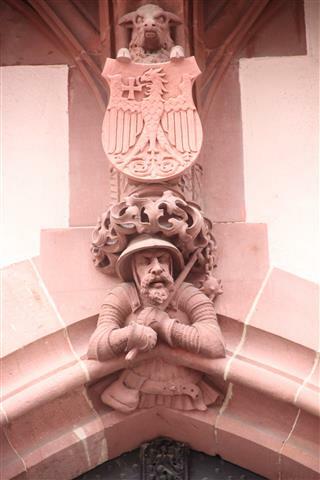 This resulted in the Löwensteinhouse having an open stairwell. The Römer was re-inaugurated in 1955. 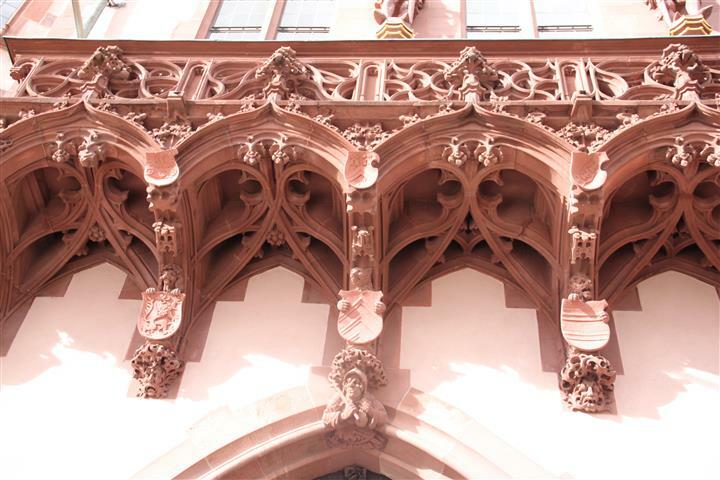 Further restoration took place in 1974 and 2005 when the houses on the Römerbergregained the neogothic look of 1900. The entire three-storey building complex occupies about 10,000 square metres and consists of nine houses, encircling six courtyards. The front, with today’s main entrance, faces the Römerberg plaza. 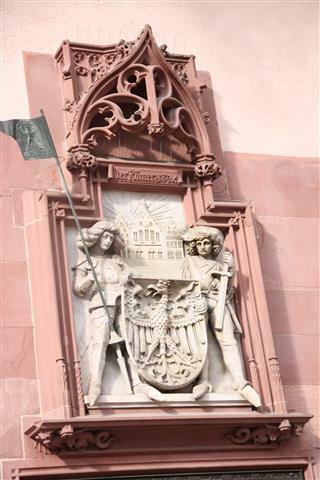 The famous three-peaked façade has medieval elements of design: The left-hand corner of the Alt-Limpurg displays the so-called Frankfurtia, the female embodiment of the city. 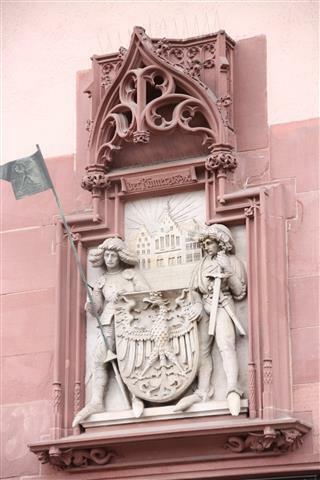 In the centre, the Haus Römer shows the four kaisers of the Holy Roman Empire, two city coats of arms, a clock face, and a placard describing the most important facts about the building. 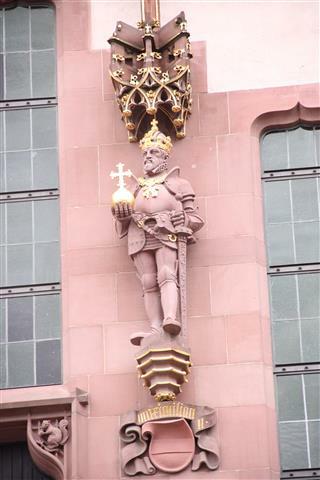 The four kaisers are Frederick Barbarossa ( first king to be elected in Frankfurt), Louis the Bavarian (gave convention rights to the city and allowed expansion of the city), Charles IV ( made Frankfurt the location of the Kaiser selection vote), and Maximilian II ( first kaiser crowned in Frankfurt cathedral). 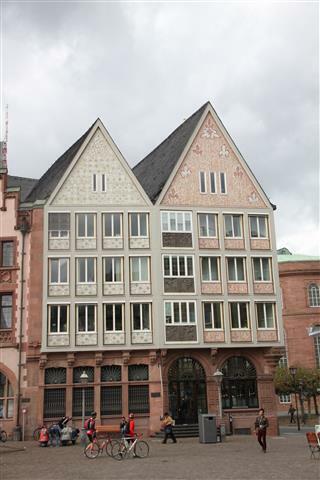 Another approach was chosen for the design of the fronts of the two north-east houses (the Wanebach and the Salzhaus). In contrast to the other houses in the complex, instead of reconstructing the old Wilhelminean front, the architects created a completely new design using a combination of medieval timber framing and modern styles. 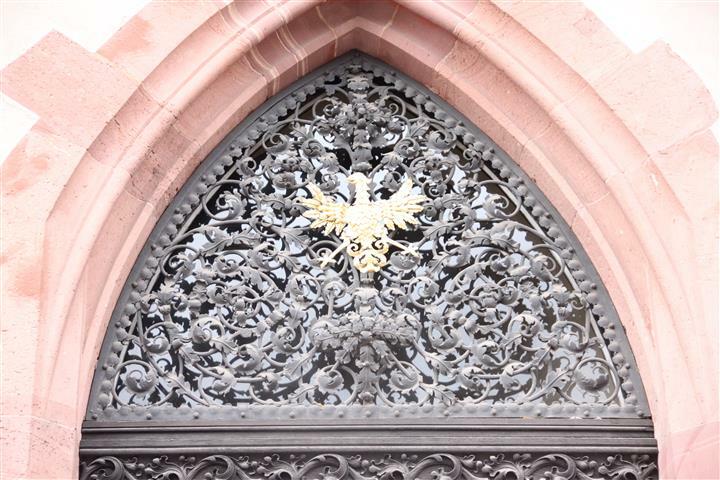 The mosaics in the timber frames feature the motif of a phoenix, a symbol for modern Frankfurt’s new start after the war. 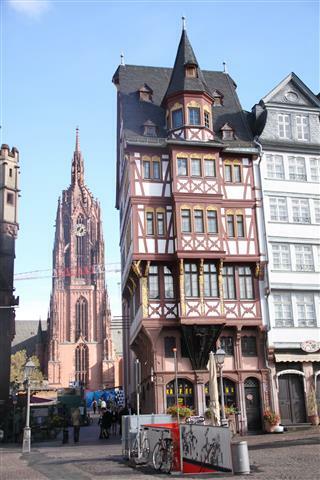 Stepping out of the U-bahn close to the historic centre of Frankfurt, you are first struck by the juxtaposition of old buildings around you and new ones in the background. 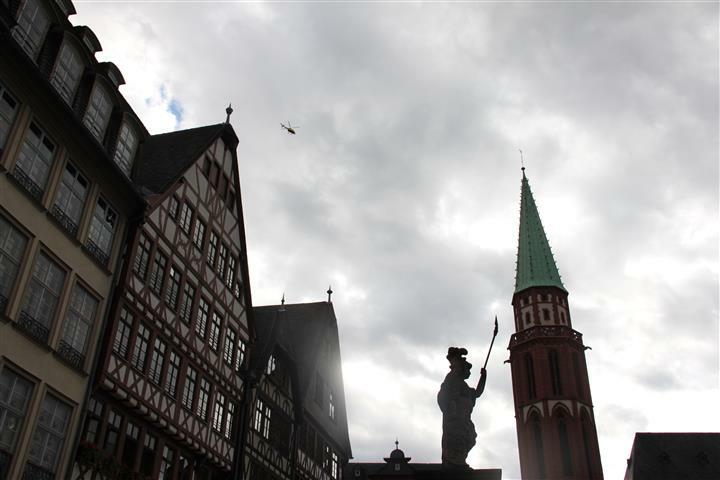 “The Römerberg (literally: “Roman Mountain”) is the historic heart of Frankfurt, Germany, and since the High Middle Ages the centre of the Altstadt (old town). 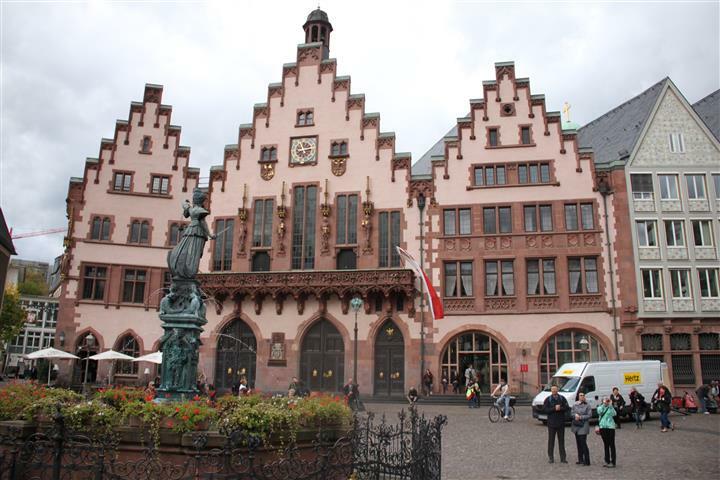 The area’s buildings include the city hall, the Römer. 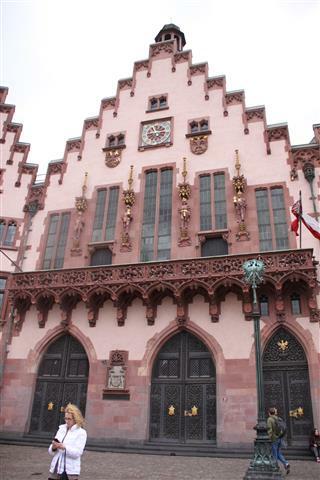 The Römer is one of the city’s most important landmarks and has been the city hall (Rathaus) of Frankfurt for over 600 years. 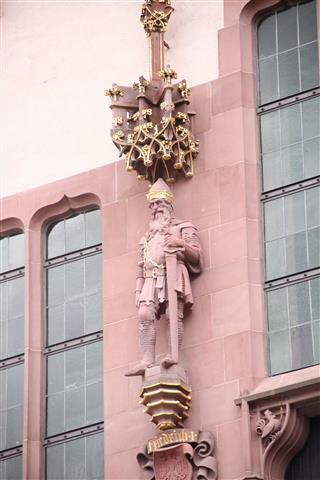 The Römer merchant family sold it together with a second building, the Goldener Schwan (Golden Swan), to the city council on March 11, 1405 and it was converted for use as the city hall. 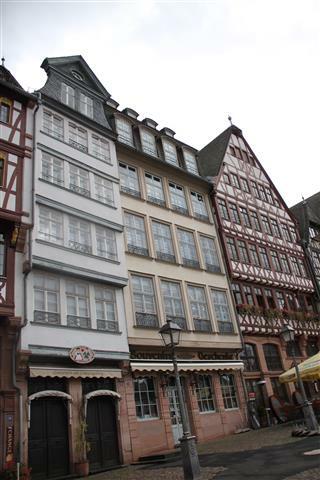 The Haus Römer is actually the middle building of a set of three located in the Römerberg (a plaza). 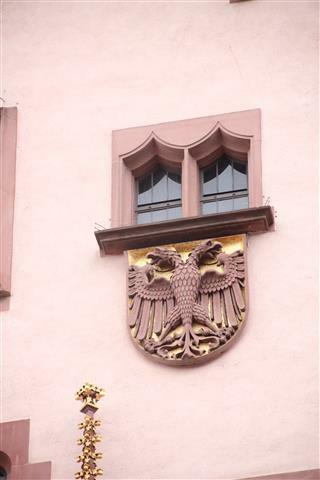 The Römer is not a museum as it is occasionally used by the city for various purposes, for example as a Standesamt or civil registration office; the wedding rooms are located in the first and second floor of the Haus Löwenstein. 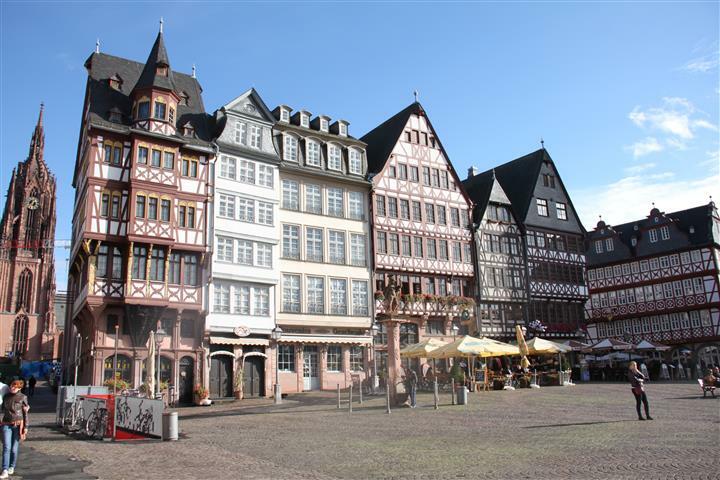 The former old town quarter between the Römer and the Frankfurt Cathedral is undergoing revelopment under the name ” Dom-Römer Quarter” and is due to be completed in 2016. 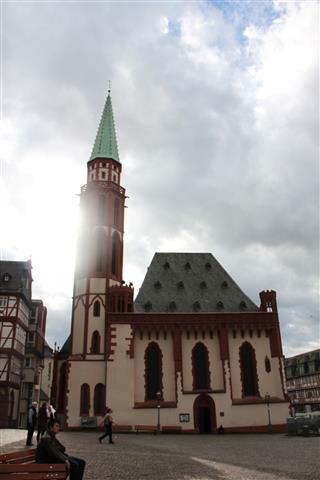 The project also includes several reconstructions of historical buildings that were destroyed during World War II. 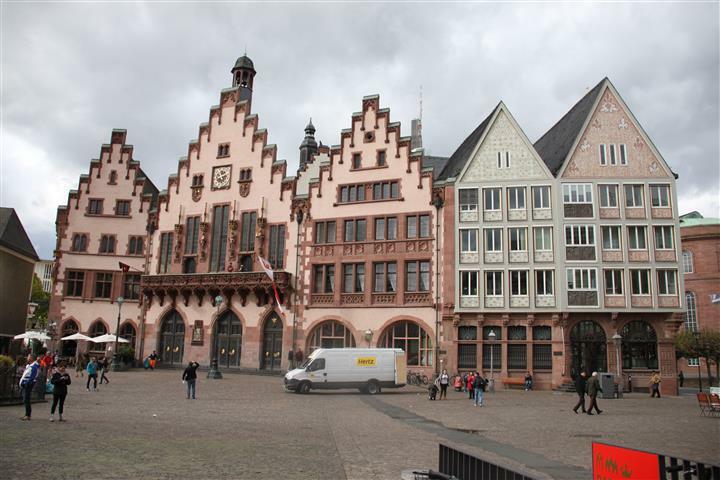 The city’s government has been located here since the 15th century, and it gave its name to the square. 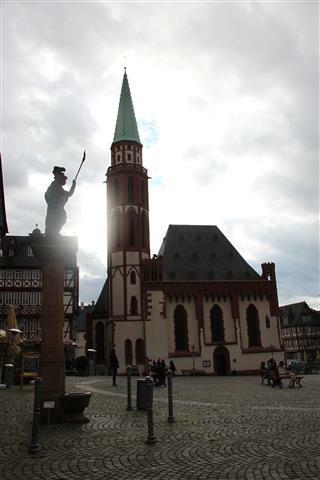 Since the 9th century, the Römerberg, formerly called the Samstagsberg, has been the site of markets and fairs, tournaments and festivals, executions and imperial elections and coronations. 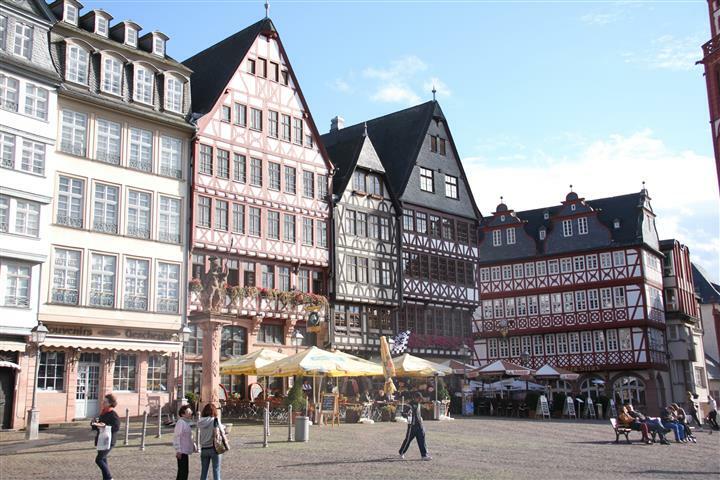 Today it is especially well known as the location of one of the world’s most famous outdoor Christmas Markets. 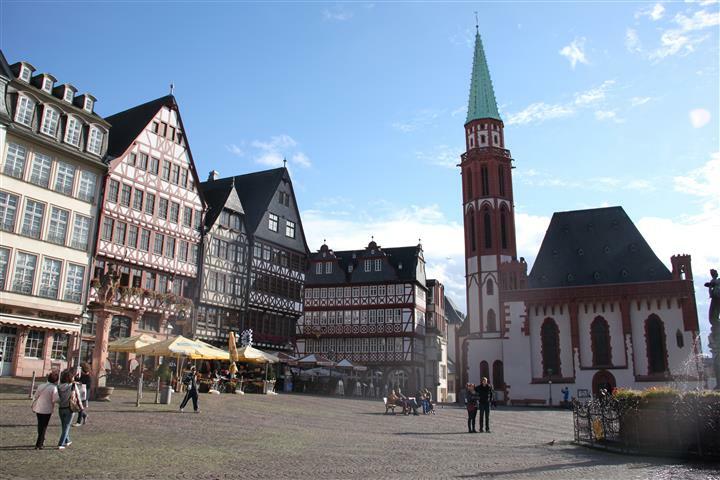 In the 16th century it was considered the most beautiful square in the Holy Roman Empire of the German Nation. The eastern row of the Römerberg is characterised by frame houses, which were built in 1986 according to historical plans. 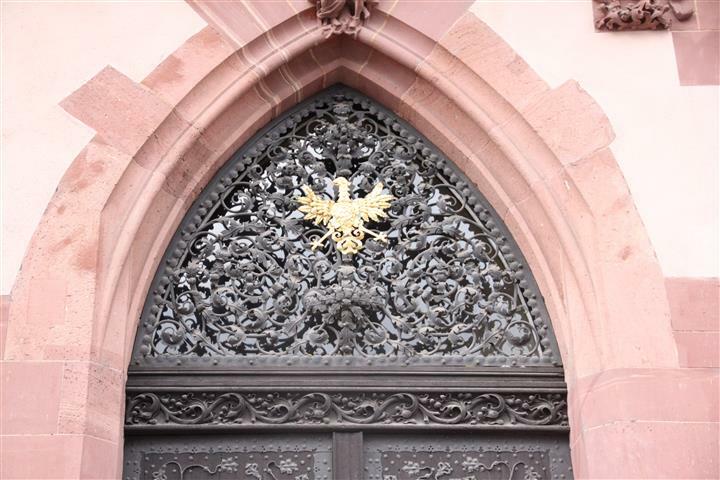 Their names recall their great and proud history: The “Great Angel”, where Frankfurt’s first bank was established in the 17th century, is followed by the “Golden Griffon”, and then the buildings “Wild Man”, “Small Badger Hill”, “Great and Small Lauberberg”. 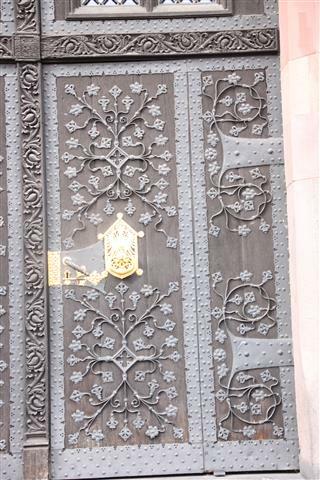 The last is the “Black Star”, right next to the Old Nikolai Church. It borders the Römerberg in the direction of the Main river. There, at the Fahrtor, is the Wertheim house, one of the few frame houses in the old town area to survive the air raid in 1944. 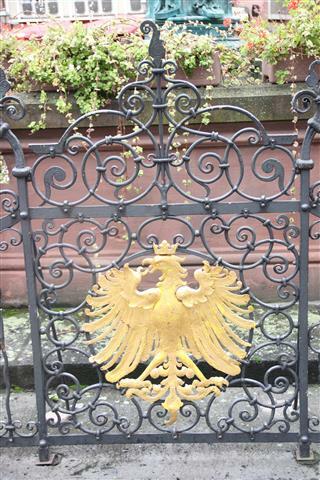 The end of the Saal Lane (Saalgasse) is located across from the Historical Museum. 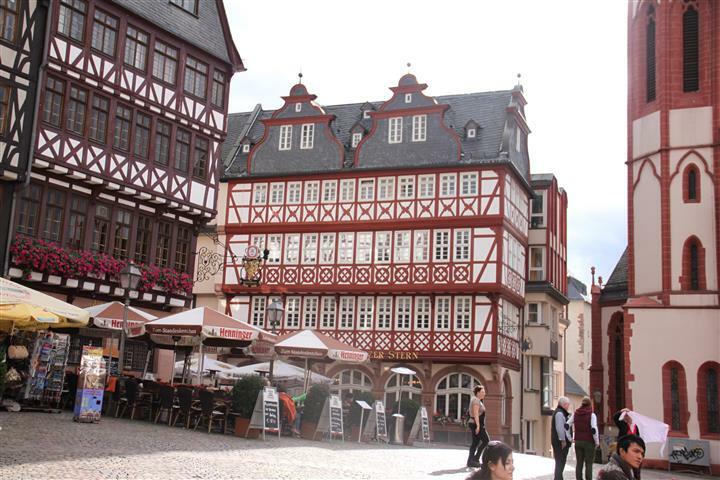 Its post-modern row of houses contrasts with the historical architecture of the Römerberg. 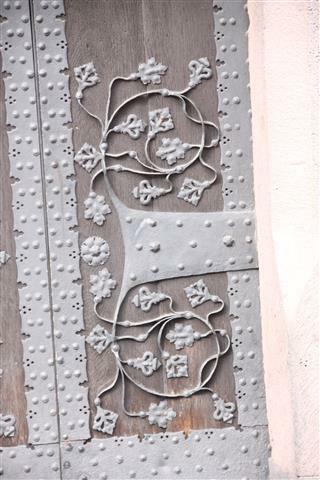 The building complex of the Römer has been continuously extended over the years, with eventually eleven houses connected to each other, resulting in a rather confusing interior. 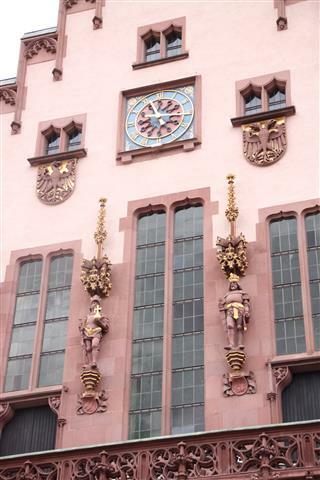 Frankfurt historian Anton Kirschner remarked that the Frankfurt city hall had “stairs, yards, halls and rooms in a labyrinthian mixture”. 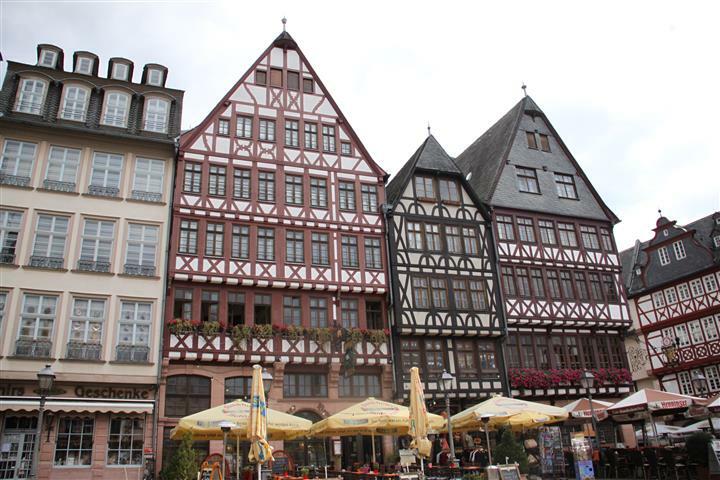 In 1435, the city bought the Frauenrode house, in 1510 the Viole house and in 1542 the Schwarzenfels house, which were all architecturally connected to the main complex. 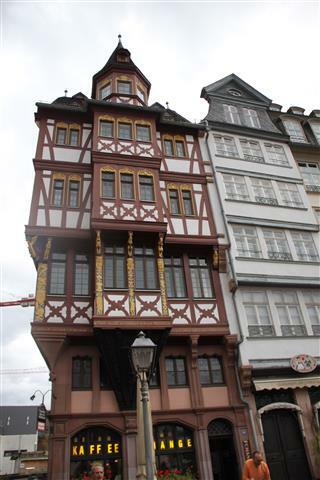 Then, in 1596 the city council bought the Wanebach house, which stood next to the Goldener Schwan, as well as the building to the left of the Haus Römer, the Haus Löwenstein, and had both of them connected to the Römer. 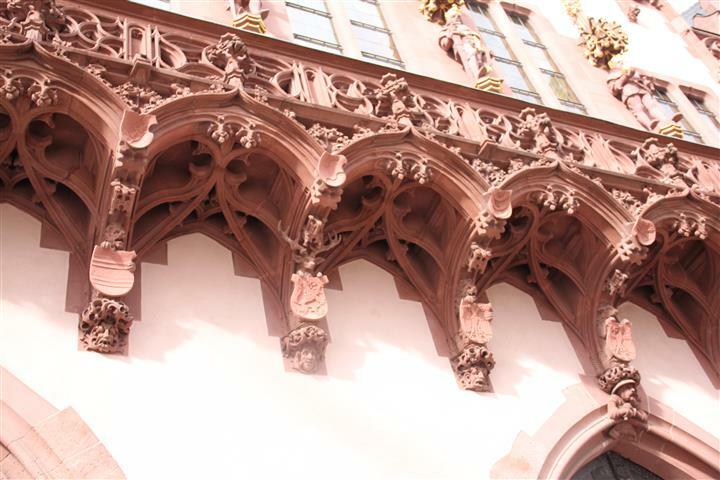 These construction projects were very complicated, since the floor heights of Löwenstein and Römer were radically different.